Hi my name is Kelly & welcome to the website. This site provides you with information regarding the types of services provided by Pet's Come first. I was lucky enough to grow up having cats, dogs, budgies and hamsters in the house so it is no surprise that I love animals. I got my first dog when I was 19, and I really can't imagine life without them. I am now the owner of 3 dogs and it is fair to say that I am dedicated to them! I love to spend my time walking and training them which involves lots of play and fun. I have taken part in many dog training courses over the years, including agility, obedience and canine behaviour. Cassie is a 12 year old Australian Cattle Dog x, rescued at the age of 10 months. Cass has taught me loads and the learning continues to this day, she is one of a kind! Coen is an 8 year old Australian Working Kelpie, has trained in agility and obedience, currently competing in agility at grade 6. A keen dog who is always ready for activity and has a lot to say for himself! He just loves to play and, thankfully, shows no sign of calming down with age. 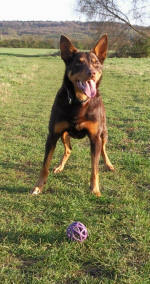 Pace is 3 years old and also an Australian Kelpie (half sister to Coen). Just as keen to play and a joy to train, a bit louder than her brother in the noise department but she is a little calmer than him it has to be said. She has recently won into Grade 5 at agility and has given me a lot of fun and unexpected achievements this year. This site provides you with information regarding the types services provided but if you have any questions at all or wish to discuss your circumstances, please do not hesitate to contact me and I will do what I can to help.